This week my fruit/vegetable co-op was super heavy with plums. As in a few pounds. That’s a lot of plums! And while I like eating them as is, it’s hard to get through them all before they start going too soft. And I hate to waste good fruit! Of course, I could make prunes. Or plum jam. But then again, there’s cake. And when given the opportunity, I always choose CAKE. 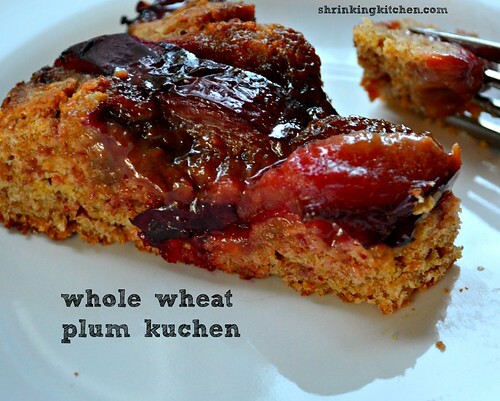 I looked around for a plum kuchen recipe and found one that looked good from Cooking Light – then I made it even healthier. Yes. I know. It’s still a cake. But this one is made with whole wheat flour, coconut sugar and less butter than the original. It is dense and absolutely perfect with a hot cup of coffee. It’s an afternoon cake for ladies who visit. Or men who visit. I don’t judge. 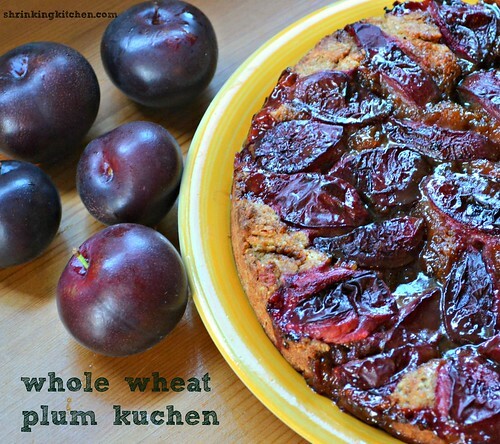 You could make this with different colored plums for a pretty (and pretty delicious) visual. I bet apricots would be awesome too! Mix the flour, brown sugar, 2 tablespoons coconut sugar, baking powder, salt in a large bowl. Add 4 tablespoons of butter to the flour mixture and cut in with a pastry blender or two knives. In a separate bowl, whisk together the almond milk, egg, and vanilla. Add the wet to the dry ingredients and mix until just blended. Spray a 9 inch round pan with cooking spray (I used coconut oil spray). Scrape the batter into the pan, lightly pressing down to get the mixture all around the pan. Place the plums on top of the batter in circular pattern...or however you like. Add the remaining sugar to the butter and mix, then sprinkle over the plums. Throw the cake into the oven and bake for 25-30 minutes. Allow to cool for a few minutes, then serve! It's perfect with a cup of coffee or tea!